The TWSBI Eco T is a pen made especially for beginners--whether those beginners are new fountain pen enthusiasts or children who want to emulate their fountain pen addicted parents. The grip of the Eco T has a rounded triangular shape to assist beginners with proper finger placement. It is a very comfortable grip (much more comfortable than the Lamy Safari), and even experienced pen users will enjoy a grip that helps them position their fingers properly. The cap finial is red with a raised TWSBI logo. You’ll notice that the cap has the same triangular shape as the grip. Inside the cap is a plastic sleeve that keeps the nib from drying out. The Eco T is a piston filler, so it is very user friendly. It pulls in a good amount of ink (1.5ml), and the ink is easy to see in the demonstrator body. You can post the cap by pushing it over the rubber O-ring near the piston. I find posting makes the pen unbalanced, however. The pen is a medium size (5.5 inches/139.7mm capped; 5.2 inches/132mm uncapped; and 6.3 inches/160mm posted) and should be comfortable for most users. The body weighs only 12 grams without ink. I thought my pen came with a medium nib because the model number on the box started with an “M.” But I quickly realized that it’s actually a 1.1 mm stainless steel stub. It writes very smoothly and with generous ink flow. I had no difficulties with hard starts, skipping, or scratchiness. In fact, I am impressed with how beautifully this pen writes. The stub nib gives the lines character and a bit of shading (with the right kind of ink, of course). One cool thing about TWSBI pens is that you can completely disassemble them for a thorough cleaning. Included in the box is a special wrench to unscrew the piston and silicone grease to lube it. In addition, you can remove the nib unit to clean out the ink that collects in the grip area. I’ll be honest. When I realized that the Eco T was a “beginner’s pen” I thought I would be disappointed with it and find it “toy-like.” I was wrong. This is one of the most comfortable TWSBI pens I’ve used. The triangular grip keeps my fingers in an ideal position for writing, and the 1.1mm nib is fantastic. I highly recommend the TWSBI Eco T whether you’re just beginning to use fountain pens or you’re a pro user. The price point is really great for a piston-filling demonstrator. You can purchase a TWSBI Eco T from JetPens for $31.50 in EF, F, M, B, and 1.1mm Stub. Posted on December 28, 2018 by Susan Pigott and filed under TWSBI, Eco, Fountain Pens, Pen Reviews. I am a waking, talking pen cliché of 2016. I bought my first fountain pen last year, along with bottle of ink. Which pen and ink? The TWSBI ECO and J. Herbin Emerald of Chivor. See what I mean about cliché? The ECO is a beautiful instrument. I got the white model and love the look of the white details with the clear barrel. The vacuum is super intuitive and easy to use. The clip is solid enough to be an everyday pocket carry. The pen is a bit long when the cap is posted, but not so much that I don’t post it anyway. The whole thing is pretty durable. From drops onto concrete to shoving the cap on instead of threading it, it has taken a beating but is no worse for wear. The weight is good, and it feels as good as it looks. I often found myself just holding it or fiddling with it in meetings. It grabs attention as well, a whispered “what pen is THAT?” or “can I try writing with it?” were not uncommon. At this super forgivable price point, I can’t think of a reason not to recommend this if you are interested in the least. I went with the 1.1 Stub nib. I write rather large, so the thick width doesn't bother me, but I can see how some might dislike it for writing. My first impression was that it is a joy to doodle with. I found myself sketching on post-its constantly. The ink flow is consistent and smooth. The nib is no doubt a huge factor here since stubs tend to have a juicier feel, or so I’ve heard. Drawing is just like writing; people have different priorities and preferences. I value line width variation above almost everything else. I love the dynamic range of the stub. Being mindful with the nib can get you fine detail lines or thick bold ones. I love pulling straight down and getting a wide line and then, not lifting the pen, changing the direction of the line 90 degrees to get a hair thin line. Changing direction to dictate line thickness is fun and adds a ton of variety. I imagine I would really dig a flex nib, but I like the predictability of the stub. I often would sketch freely, without being mindful of line weight, then going back in with adding thickness later. My main draw to fountain pens was bottle inks, I use lots of India inks and acrylic inks with brushes, but wanted to try out the other side ink world. Plus I really like the atheistic of bottle inks and fountain pen inks are some of the most beautiful bottles in the world. J. Herbin really outdo themselves in packaging. The box is wonderfully decorated but nothing worth saving, the bottle is the main show, with it’s wax seal, gold string, and cube angles. I have mine on my desk at all times; it is too pretty to put in a drawer. Filling the pen is a joy, the barrel of the ECO fits perfectly into the bottle opening. It is a pleasant ritual that I enjoy, and have a hard time believing that I would ever find similar joy in replacing a cartridge. It is not waterproof, but that’s not the end of the world. It can actually be blended with water if you are careful about it. The stub nib really lets this ink shine, literally. It is a thing of beauty just to watch the ink dry as you make lines. I filled sheets and sheets of hatch marks when I got this pen, almost hypnotized. It dries quick enough to sketch with and looks like nothing else out there. · I sometimes hate that I have to twist off the cap, but I love the security of a twist cap. · I wish I had an erasable option, but I love watching the liquid ink dry before my eyes as I draw. · I miss the utilitarian metal pencil body, but not as much as I love watching that beautiful emerald ink slosh around the clear barrel of the ECO. The ECO has lasted over six months as my main carry, and if it broke tomorrow I’d be placing an order for another of the exact same. The J. Herbin bottle sits proudly at my desk, and even after several refills I have so much left that I haven’t gotten wistful yet. I can’t think of a better recommendation than that. Posted on November 21, 2017 by Brad Dowdy and filed under TWSBI, Eco, Fountain Pens, Pen Reviews. Like many in the pen community, I was anxious to get my hands on the TWSBI ECO. I saw it as an important release for one primary reason, a reason no other manufacturer has been able to pull off with any success, or even attempt. Could TWSBI deliver a quality, low cost, piston filling fountain pen? Without question they can, and they did with the TWSBI ECO. The idea of the ECO goes back almost two years. TWSBI likes to share design prototypes and ideas through their Facebook Page to get feedback along the way from their customers and fans. Not all pens that show up on Facebook make the final cut, and for a while many wondered if the ECO would come to fruition. I wondered that myself, especially from a pricing standpoint. There would have to be a large enough gap between the new piston filler and their existing ones in the Classic and 580 lineup. Then one day it happened. TWSBI announced a release date and a price. For less than $30, TWSBI was set to compete with any entry level fountain pen on the market. Especially the Lamy Safari, the long-standing dominant pen in this realm. The overall design of the pen is an economical one in an effort to keep the cost down, hence the name ECO. There aren’t many moving parts outside of the piston, and the clear barrel is accented only with a white or black cap and matching piston knob. I think the cap itself is a little chunky compared to the rest of the pen and wouldn’t mind if it were slimmed down a bit. It is also too big to post and keep a good writing balance. The ECO’s piston filling mechanism works smoothly and effortlessly, just like in their other models. If, over time, the piston needs to be re-lubricated, TWSBI includes the tool and silicon grease to do just that. I’ve done this on my TWSBI Mini before and it is a simple task. Instructions are even provided in the form of an insert. I’m a big fan of all of TWSBI’s nibs, and the #5 steel nibs in the ECO are no exception. The extra fine nib in mine is firm and smooth, with little to no feedback, no hard starts, and no skipping. It is spot on, and a pleasure to write with. This is a flat-out cool pen, and one I have been recommending constantly since its launch last summer. For someone like myself who has some experience with fountain pens, the ECO is a daily workhorse that can be taken out, used and abused, refilled, cleaned, nib swapped, and any other worry-free fun you want to have with a low cost fountain pen. For beginning fountain pen users, it is a fantastic choice as well, and second on my Top 5 Pens Under $50, behind only the Pilot Metropolitan. If you have never used a fountain pen before and want to jump right into bottled ink instead of cartridges, the ECO is the way to go. 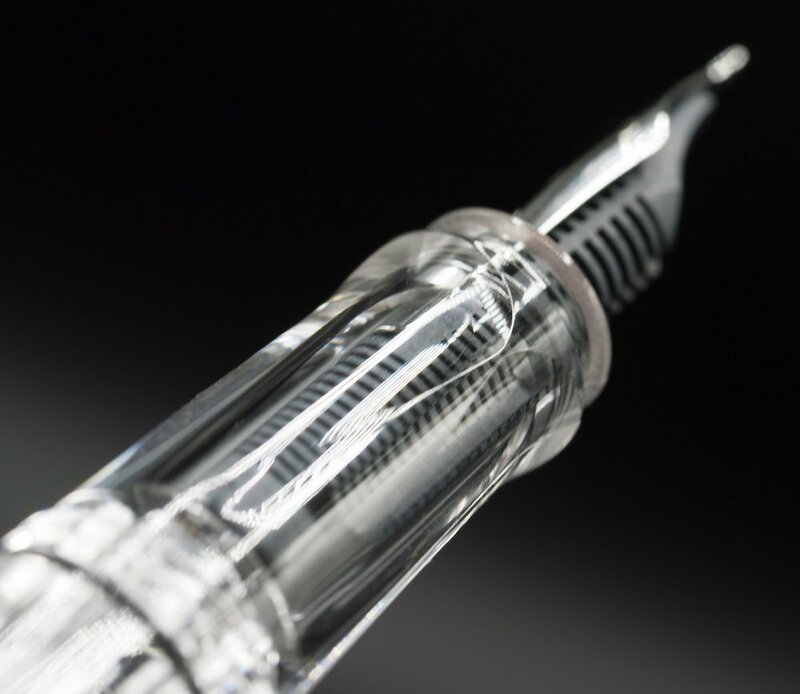 It’s clear by now that TWSBI has another hit on its hands. They are already teasing new colors in the lineup and I know I won’t be able to help myself when they launch. I bet many of you feel the same way. Posted on January 25, 2016 by Brad Dowdy and filed under Eco, TWSBI, Pen Reviews.